Black is the darkest color, and blue is the warmest one. And if you are a fan of both colors, why not to try mixing them in one unique black and blue nail design. Wednesday Addams, who is a black color fan, says that “I’ll stop wearing black when they invent a darker color”. However, she knows that there is nothing darker than a black color, so she will never stop wearing her favorite color black. On the other hand, blue symbolizes trust, loyalty, confidence, and as John Ruskin says: “The purest and most thoughtful minds are those which love the blue color the most”. Well, combining these two incredible colors together make up the best nail designs anyone has ever seen. So, if you are a fan of both black and blue colors at the same time, you have to check the following list of 10 creative black and blue nail designs. If you love acrylic, browse the acrylic nail designs we love. Use the blue color to have a nail of cornflower color, stripes of black and blue in the ring finger, and with a blue base in order to draw black flowers stick together to make a floral style in the index finger. Blue is the warmest color, so what is better than a blue nail design? Well, there is something better which is a black and blue nail design, by having a blue fading base designing it with tiny flowers of the black color. For a simple black nail design, you need a little touch that brings your tiny cute nails to life. 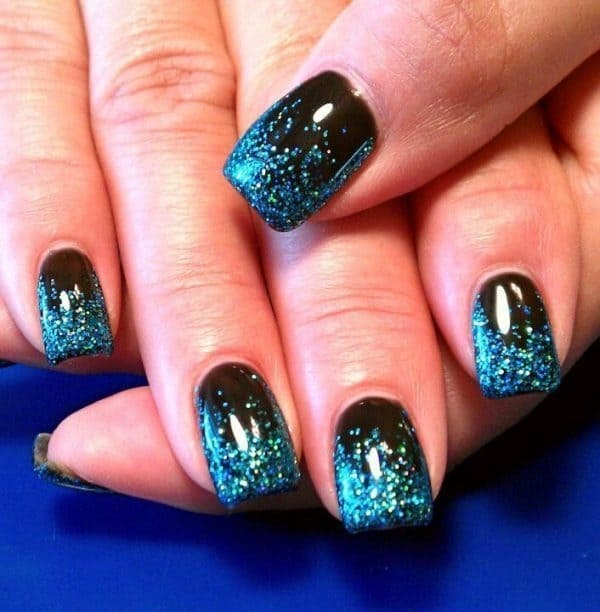 On example is adding blue shiny, glittery, and shimmering tips that start fading into the black color when they start entering the black color slowly. In this design, the cross symbol is what manages everything by having a light blue base decorated with a black cross, a white cross, and a sapphire blue cross on each nail. The blue matte color in the index and the ring finger designed with a single black decal, in addition to the thumbnail decorated with silver glitter at the bottom that l0oks like snow falling on the nail, the middle, fingernail made up of a black base and white decals and the pinky finger covered with silver shiny shimmer all make up the perfect black with blue nail design. This is one of the unique black plus blue nail arts. Nails are colored with azure blue and used as a scratch paper that you scratch on it with a black marker, but this time the paper is not white it is blue, and you are not using a black marker but a black nail polish brush. A fusion between the navy blue and the black color is done in the above nail design in the normal form of the thumbnail and the ring nail but in the form of tips with a transparent base in the pinky, middle finger, and the index finger. Let the blue sky meet the blue sea and all is blue at a time. This is what happens when summer is just coming over, you start thinking of Hawaii palms with the clear blue sky and the blue fresh sea. And you probably wanna meet summer and the beach with a cool nail design, and the best choice is a blue nail design with black palms that will live up summer vibes. You can see a woman in every flower, however, in each woman, there is a flower. So the best way to describe any woman is by a floral style of her own in her black nail design with a Carolina blue flower and a white flower. Represent the bright and dark shades of blue. The sky at night contains different blue shades from dark to light blue! Try to represent this in your nail style, and add stars by the help of white color. Finally, blue is the warmest color and the best in nail designs, however, there is a shopping rule that says that” If it is not black then put it back” which means that black is the best color for color and in nail designs as a matching color for a black suit or dress. So if you want to have the best nail design why not to try a black and blue nail design that makes your hands full of chicness from the black color and full of loyalty, honesty, and smartness from the blue color. If you are interested take a look at the list of 10 black and blue nail arts. Hope you like it!